We all have lives just let us know if you are going to be away for a couple days. This is all we ask we do not ask for any reasons as to why you are going to be gone we just don't want to assume that you don't want to be apart of this forum any more. Taken a week off. I will return next Week on Wed. I am going spend this week playing games, and get this fix off. I promise you all to whom ever I owe posts. They will get them. 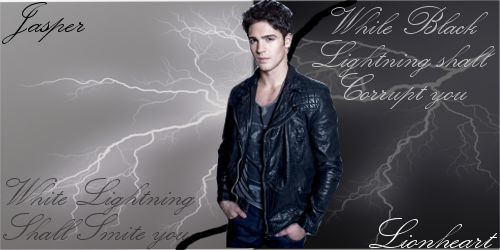 Credit goes to the lovely Jules for the Sig. Seems gaming didn't go to good. I have officially returned earlier. I am back to posting. unknown time period internet issues. past few weeks couldn't load or keep loaded the site due to country side internet...until further notice I be here as much as possible but working on fixing internet issues. I shall again take another week off to game. I might return earlier. As these games will be very addicting. But I can assure you. Next week on Tuesday, I shall do posts to everyone I owe. Forgive me again for the games to take over my role playing life. So I am taken a month off. I am sorry that I have to do this. BUt I need time to myself. And I need to figure out some things that and game some more. I hope you all understand. I am deeply sorry for all the waiting I am causing you guys to do. I shall return on the 16th or 17th of July. Certain people I know, Casey, have been requiring a lot of my time. Technical difficulties with devices has further led to my inability to get on. If I have any posts I will get to them shortly. I live my job and even while staying in country my work never really ends. Right I need to sort something out so I will be on and off for the next few weeks or months. Jules is in charge for now. This isn't forever but I haven't been the same since my accident and I need sometime to find my true self again. So, I will be away from the site starting Sunday for an unknown amount of time. I am moving to a new house with my parents and I don't know how long it will take for the internet to get installed, (it may be later that day, we don't know yet) I will be back as soon as I can. So yeah, with summer comes camping season, and come camping season means hundreds of children wanting to camp at the camp I work at.. which means I will be away a lot this summer. Starting tomorrow I will be away until AT LEAST friday.. and if I get the first two weeks of camp, it could be 2 3 weeks from today that I return. To those I owe posts to.. I am sorry I didn't get to them today.. I have been super busy getting ready and this is the first time I have had a chance to get on all day. I'm going to be away for a while, not that I was doing anything. I should definitely be back in August, though I might return mid-July. -and technically Sarah Lionheart, but I hadn't finished her form yet. You will all be missed. Hopefully everything goes well, you have a good time, or its as fun as possible. Depending on which fits your situation. ^_^ Most of all try to have a good time regardless of the good or bad of things. Credit goes to Jules for making this Lovely Sig..
ANd taken another month, With College coming up. I gotta pick classes, and me finding a job is a must. Along with other things I need to sort out, I am extending to another month. I am sorry for the wait guys, But I will be back. Reason: Personal things as well as apartment/house hunting. Computer time will be limited. So posting will be slow. I apologize.